Pendeen is in excellent condition. Unlike all the others, except neighbouring Lower Boscaswell, it stands proud of the surrounding landscape and is very obvious. It would certainly not have been a good place to hide although it might have been surrounded by houses. It is situated at one end of a farmyard next door to the house in which William Borlaise grew up. He went on to become Cornwall’s leading 18th century antiquarian and it is nice to think that he was inspired by the fogou in the bottom of his garden (ignoring the less romantic idea that he might have had it constructed in the manner of a folly). As with other fogous, there is a lovely sense of continuity with the farmhouse which is an architectural gem of its own. The house clearly dates back many centuries and it is not hard to think that man has been living on this site since the fogou was in use. Pendeen is a classic with a creep passage and rab-cut – cut out of the earth – chamber. 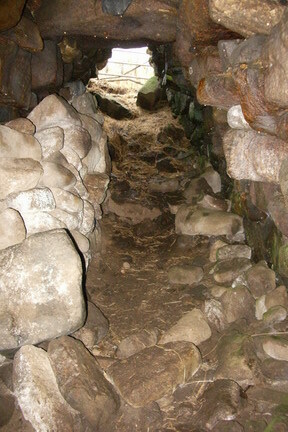 The main passage drops away from the entrance and you will soon find yourself up to your ankles in slurry. There is a low arch in the middle of the passage with a piece of wood thoughtfully provided for those who wish to squeeze through on their backs. 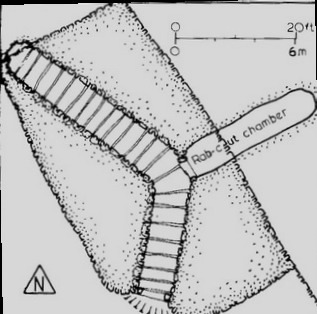 There is also an excellent creep exit which opens onto the hillside below. The picture on the left shows the mound as seen from the farmyard. If this were not an agricultural site then there might be some more vegetation to disguise it from the distance but there are precious few trees on these exposed clifftops. The views towards the lighthouse and sea are simple glorious and make Pendeen a must for a visit.